We have developed four basic types of Power Cat in this size range: one for planing, one for semi-displacement power boating as is shown here, one for displacement trawler-yachting that is essentially the same as this design but makes use of displacement hulls, plus a slightly larger one for fast motor-sailing. The one shown here is modeled after semi-planing types, mainly in order to get the best of both worlds: i.e. fast performance when desired, and also long range for the sake of world voyaging. Although this design is shown at 50' overall length, the design can be sized to whatever beam or length is suitable to the intended use. I have called this model the 'Wave Cat' since our 48' Rhumb Runner design was the parent mono-hull which provided the primary source geometry. The Wave Cat hulls are symmetrical, and have a 'spray-knocker' at the chine, which widens as it goes aft for the maximum lift. As a result, this model will perform well in the higher end of the semi-displacement speed range. The semi-planing shape was chosen in order to provide a broad range of speeds: either fast power boating at semi-planing speeds, or efficient travel at slower speeds. The Wave Cat is an excellent choice for long range voyaging - having a slender and easily driven hull shape. One engine can be turned off and the speed / power / fuel use thus made very suitable for long range under power. The overall configuration is designed to give an easy motion and of course with a catamaran there is very little roll. The Wave Cat model shown here was given fairly 'trawler-like' house structures with a walk-around deck aft that is all under cover. There is also a full height bulwark all around the side and aft decks. Forward of the pilot house, the foredeck is raised for the sake of maximum interior space, and for maximum reserve buoyancy forward. The Wave Cat will be best if kept relatively light in weight. Steel is probably not a viable option until the size approaches around 70 feet. Aluminum would be ideal, as would GRP. If built in aluminum, the greatest construction efficiency would be achieved via NC Cutting of the structure. What is NC...? It simply means 'Numerically Controlled' and implies that the plates and internal structure will be defined by computer modeling, and will be pre-cut by plasma jet or by water jet cutting. This has the potential to save a considerable number of fabrication hours, and offers the benefit of extremely accurate fit-up of the parts. Ordinarily NC Cutting is most conveniently applied to metal structure, although it is a technology that is just as readily adapted to plywood construction. 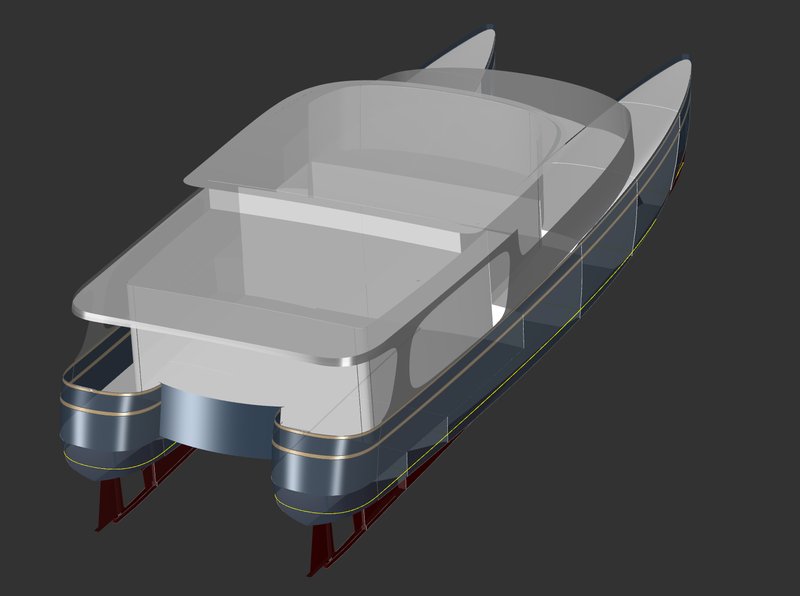 For a vessel built of fiberglass, computer modeling can still provide an excellent advantage in terms of achieving the mould shapes. Many builders have taken advantage of this technology, where either a plug (male) or mould (female) will be cut out of foam by a large 5-axis router. This eliminates the complex and labor intensive mould-building step, entirely eliminates lofting, reduces shop space requirements and builder lead-in time - ultimately saving labor and overall costs. • Right forward, the forepeak in each hull for anchor chain, etc. • Aft of that a small private sitting cabin or office or berths for children. • Aft of that the pilot house and dinette / observation seating / possible pilot berths above and aft of the seating. With that configuration, the basic intent is to achieve a high degree of comfort and privacy for two couples, possibly with one or two children using the cabins below the pilot house (forward of the engine rooms). If the overall length were reduced, the accommodations for crew and guests would become proportionately smaller. For example, at around 40’ LOA the same layout as described above would still be possible, including pilot berths in the pilot house for children or casual guests. Since we nearly always work with new designs on a custom basis, we are able to develop just about any type of vessel, or create any variation on a theme. As a boat becomes larger, naturally there are a much greater variety of cabin arrangements possible. For more information on this or other designs, please inquire.